Laptop & Apple MacBook Repair Service in Berlin! Do you have a problem with your laptop or Apple MacBook? 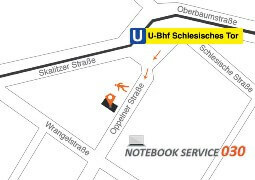 We are a fast and reliable team in Berlin-Kreuzberg, repairing notebook, Mac and PCs. The malfunction diagnosis is for free and will be done immediately at our shop. Are you interested in buying a refurbished Laptop or Mac? We regularly offer Notebooks in great condition. Don´t hesitate to come to our shop - no previous reservation required! Are there questions for us? Call us or write to us over the contact form. You can save a lot of money if you get your notebook repaired by an expert team. Notebook Service 030 is this expert team. We do all kinds of repair and help maintaining your computer in best condition. Just come around without previous reservation and let us solve your problem directly, competent and well-priced. You are looking for a used but professionally reconditioned Apple Macbook Pro or another laptop that meets your demands? We would be happy to offer a fully revised second-hand computer with top-class hardware and 1-year warranty. Your MacBook or laptop having a problem is trouble enough. With our service, you can avoid high costs if you prefer a well-priced repair instead of buying a new device. We offer free malfunction diagnosis and look for an overview, which parts are faulty and not working properly. Our offered repairs are mainboard repair, replacement of keyboard, display and charging socket and thorough a professional cleaning of the cooling fan system. You have a broken display You have a broken display or image defaults like white spots? Are there pixel errors or the screen is too dark? The three most common display malfunctions are broken glass, line errors and scratches. Fortunately they don´t mean your notebook is electronic scrap - we will find a suitable display for your notebook and replace it on the same day. Your laptop image shows weird symbols, has streaks or is divided into several sections? These are signals for a defective graphics unit which occur in almost all notebooks and are a common failure cause. As a long-term prevention we recommend to let do a professional cleaning of the cooling fan. We offer free malfunction diagnosis and immediate replacement of the graphics card (usually on the same day). Your laptop does not charge anymore? The charging socket is has a loose contact or is your charger / power adapter damaged? A defective socket on your Notebook or MacBook may cause subsequent damage to the battery. We replace DC and power sockets on the same day! If your Charger has a defect, please do not throw it away! We repair power adapters, required it is an original one, within a few hours! Especially the Repair of Apple Mac Chargers(MagSafe Power Adapter) is fast and for an affordable price realizable. Is your PC or Laptop defective and you forgot to back up your data? We restore lost or accidentally deleted data and save it for you on an external harddrive. With our long-standing experience in data rescue and computer repair, we can help even in cases you gave up on. We also install operation systems and other software. On a new installation of the operating system or at an upgrade we offer to migrate your data to the targeted system. This will save you the reorganizing of your files and programs, so that you can immediately continue working. Your notebook gets hot and makes a loud noise? If the fan system of your notebook gets too dusty, the ventilator cannot dissipate heat. Your notebook cannot work properly and the emerging overheat will cause serious damages. Especially at summer time, we recommend to let do a proffessional cleaning of your laptop. Otherwise, thermally sensitive components such as the graphics Unit could be damaged over the time. We give the cooling fan system of your notebook a professional thorough cleaning and use a special conductive paste to maintain it in best condition. 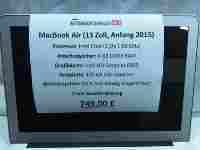 Looking for a good, second hand refurbished Laptop or Apple MacBook? We offer affordable used, good conditioned Laptops and MacBook Pro, completely checked, installed and "ready to go".